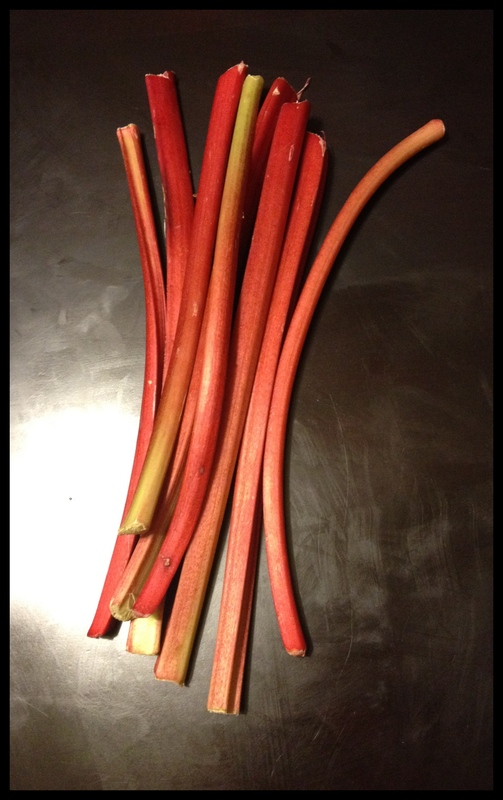 Is it strange that I remember the first time I ever heard of Rhubarb? It was one of the first times I was up in Watkins Glen, NY, visiting Brad’s family. We were driving back from hanging out in Ithaca and passed a sign that directed us up a side road for fresh produce. I was expecting a tent, a van, or maybe a little shack filled with all kinds of produce. Oranges, Apples, Citrus, Veggies… You know, a normal side-of-the-road produce stand. But we pulled up to a wooden structure with faded and peeling red paint. It was about the size of an outhouse. There was Rhubard laid out on a shelf next to a box with a slit in it for money. A sign hung from the side that said “Rubarb $2”. I mean, farmers just leave their produce out on a road and ask for people’s honestly when taking some and leaving their money?? Let me just say, that is NOT the way things work where I grew up. Or most anywhere I’ve ever lived. Kind of sad that I was so blown away by this show of faith in human kind, right? Now it’s about five years later and I still have a very vivid memory of that Rhubarb stand. We didn’t end up buying any, we weren’t really in the market for Rhubarb that day, but since then I have seen the mystery fruit (yep, its actually a fruit) pop up on dessert menus all over. Which leads me to our holiday cocktail – because you didn’t think I’d let a holiday slip by without pairing it with a little booze, did you? I will admit, I can’t take all the credit for this one. 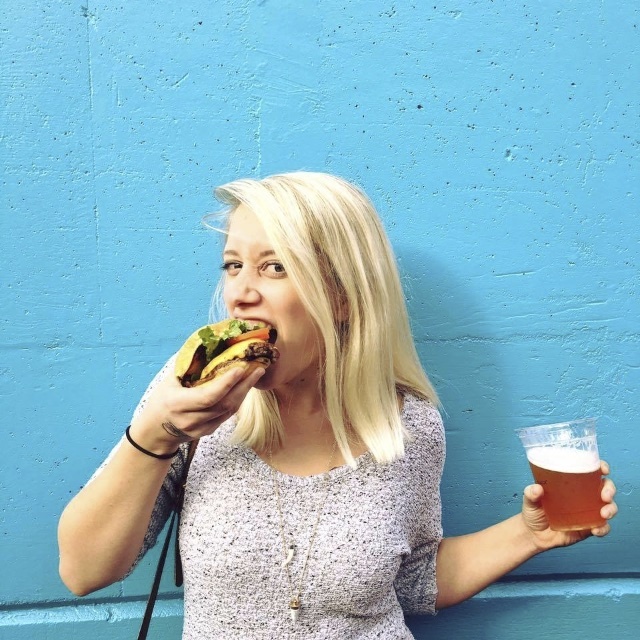 I mentioned before that I walked around the Farmer’s Market last week with Liz, our kitchen manager at R+D, and we brainstormed all kinds of cocktails to feature in the upcoming months (stay tuned – all sound delicious). At one point we walked by a big pile of beautiful, bright red rhubarb and Liz said that she wanted to do something with Rhubarb and Strawberries. 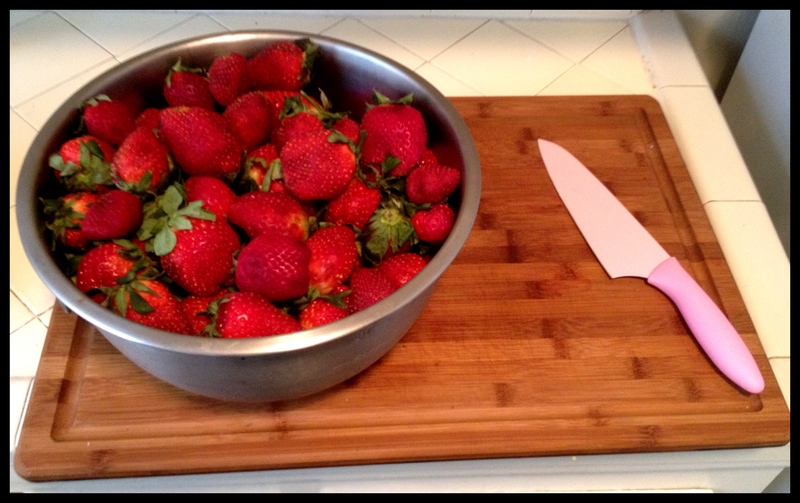 Ok, now if you don’t know, Strawberries and Rhubarb are a pretty classic combination. You’ll often see it in desserts, where the tartness of the Rhubarb perfectly balances the sweetness of the Strawberries. Trust me. If you ever see a Strawberry Rhubarb Crumble on a menu, try it. Especially if it involves a scoop of vanilla ice-cream. And especially if you are at Gjelina or Just a Taste. And please share with me. So running with Liz’s idea, I thought we should feature a Valentine’s Day cocktail on our special menu at the restaurant this evening. 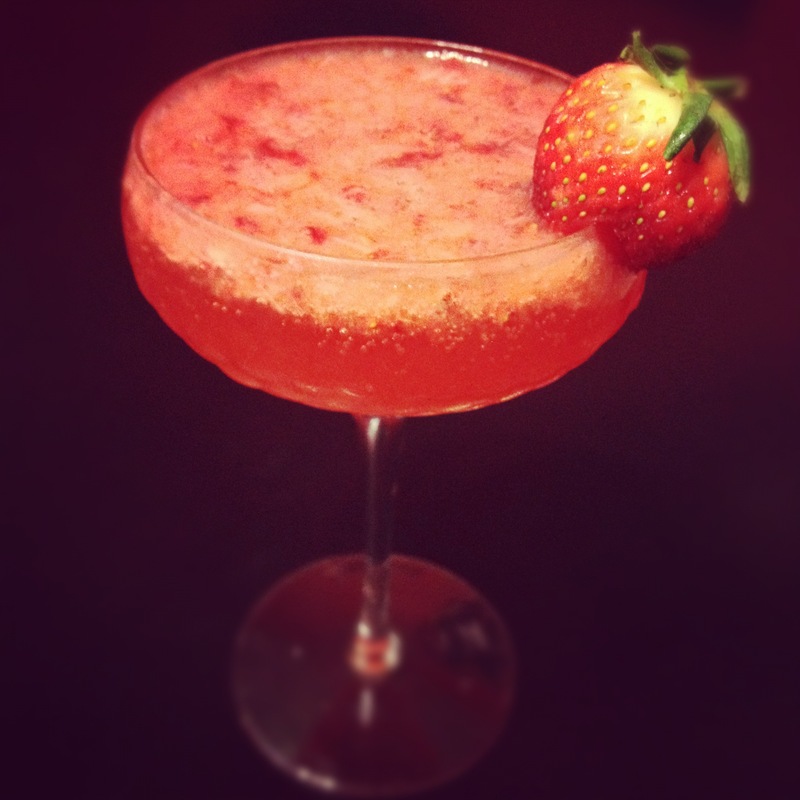 A twist on Strawberries and Champagne maybe? And why not make it Farmer’s Market fresh? 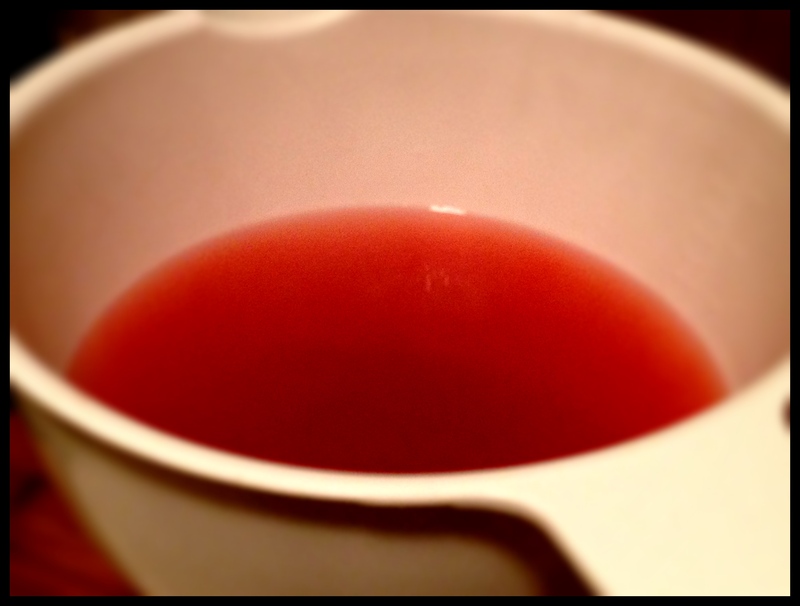 I present to you the R+D Valentine’s Day cocktail…. 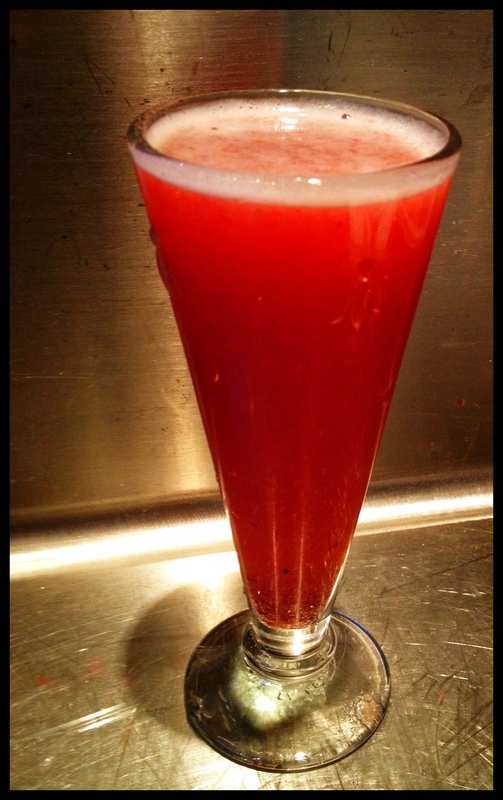 If you don’t feel like mashing up a bunch of strawberries and cooking it down, head over to R+D tonight. But if you’re feeling like getting down and dirty in the kitchen this Valentine’s Day, here’s how it goes. Note, this can be served in whatever glassware you choose. I just really love my vintage-looking coupe glasses. I feel very chic when I use them. Another note- this cocktail is super easy and since all the flavors pair together perfectly, it can be made with whatever portions you decide taste best. I liked a lot of bubbles in mine and not so much vodka, but this can also be served as a martini with just a floater of the bubbly stuff. Mix it up and find your favorite! 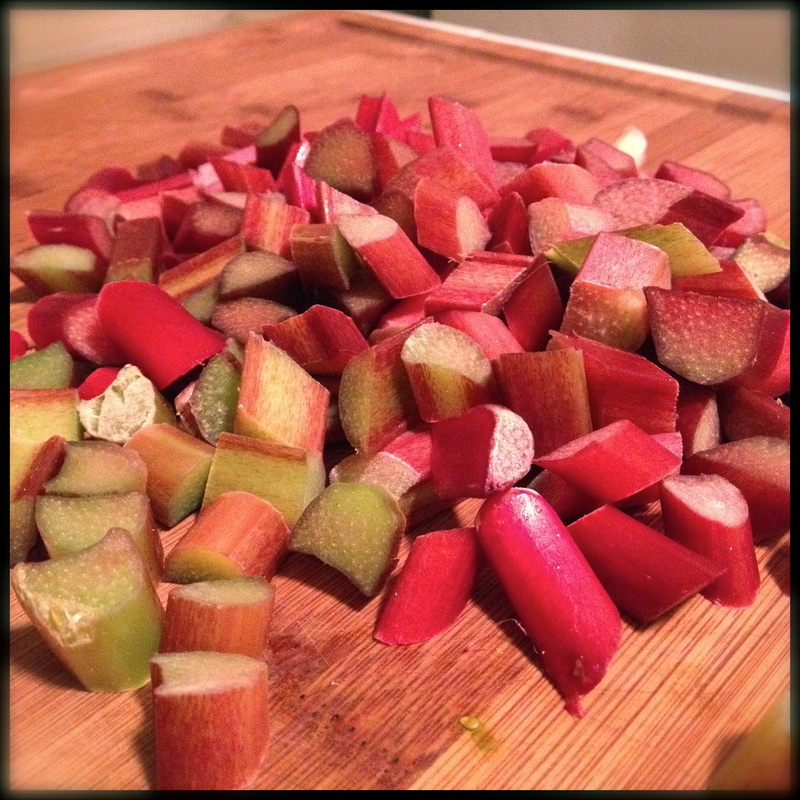 First, chop your Rhubarb into small pieces. After about 30 minutes, strain the mixture through a fine mesh sieve. 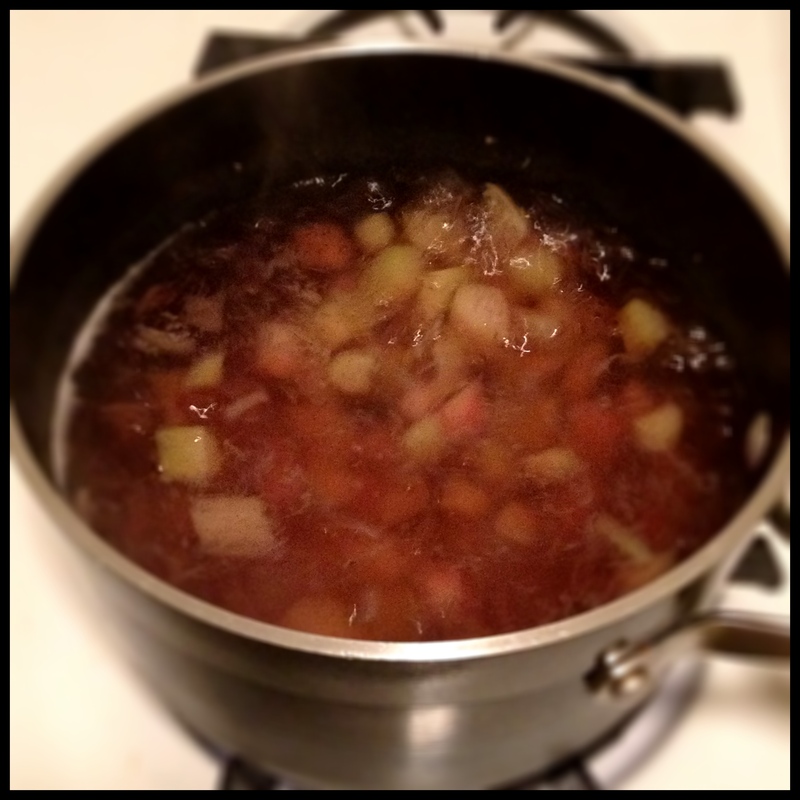 I then stirred the mashed Rhubarb bits back into my mixture because I liked the extra flavor and texture it provided. Return the mixture back to a pot and bring back to a slow boil. 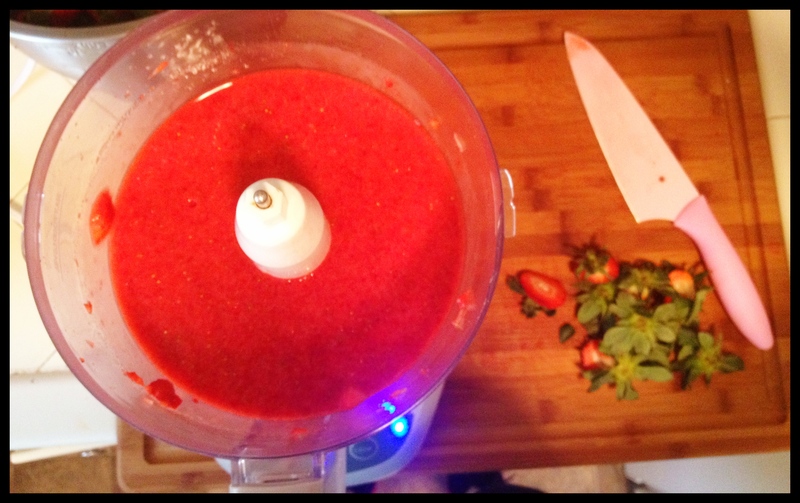 Cut the stems off of your Strawberries and blend in a food processor until smooth. 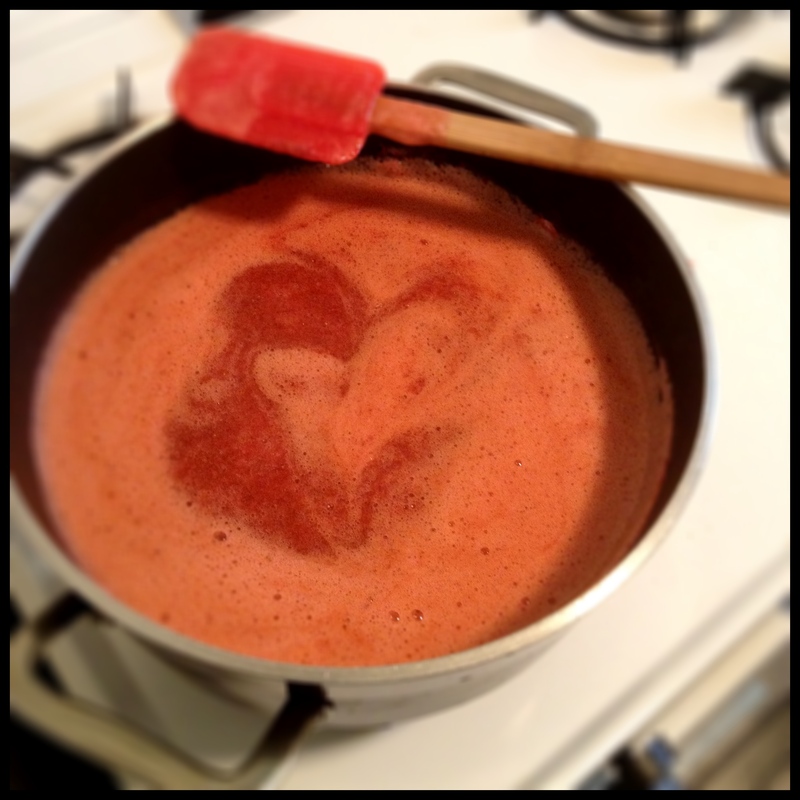 Mix the strawberry puree into the rhubarb reduction and add sugar to taste. Allow to gently boil for about 2 hours or until the flavors have intensified to your liking. Store in the refrigerator for mixing into cocktails, yogurts, or desserts! I hope you all have a Valentine’s Day filled with love and bubbly!